I am going to show you how the energy lost from the gravitational red shift of light coming from the photosphere of the sun is sufficient to power all of the fast solar wind. The mechanism for how this would happen is a prediction of a new theory of cosmology and gravity that I have developed, which also correctly predicts the speeds of the solar wind, its composition, and the ratio of matter lost through the solar wind to the matter converted to energy in fusion reactions. You can read about this overall theory by clicking here. Meanwhile, I will show you the math pertaining these aspects of the gravitational red shift powering the solar wind. In the case where one proton is converted into energy, and the red-shift energy loss is carried away as one proton in the solar wind, (mc/mw)½ = 1 and v = 437 km/s. In the case where two protons are converted to energy, and the red-shift energy loss is carried away as one proton in the solar wind, v = 436.74972 x 2½ = 618 km/s. In the case where three protons are converted to energy, and the red-shift energy loss is carried away as one proton in the solar wind, v = 436.74972 x 3½ = 756 km/s. In the case where four protons are converted to energy, and the red-shift energy loss is carried away as one proton in the solar wind, v = 436.74972 x 4½ = 873 km/s. One would expect the measured speeds of solar wind particles to vary somewhat from these speeds due to gravitational slowing and magnetic field acceleration. 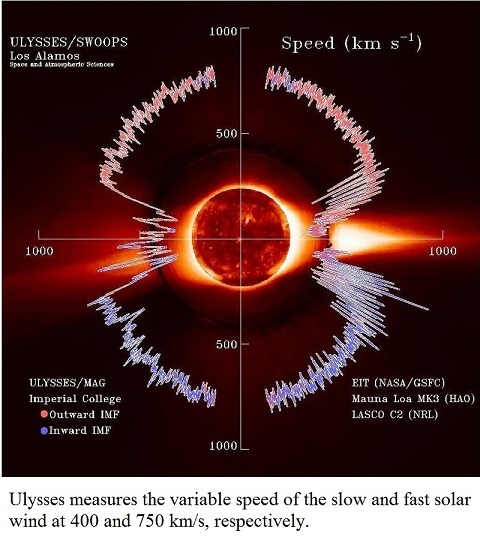 Overall, though, these speeds correspond well to the speeds of the solar wind observed by the Ullyses space craft, as shown in the diagram below. The one particle conversion solar wind speed of 437 km/s is typical of the speed of the slow solar wind, which you can see from the diagram varies from just below 400 km/s to almost 500 km /sec. The two particle conversion solar wind speed of 618 km/s is significant, as this is also the escape velocity of the sun, so it represents the lower speed limit of the fast solar wind. The three and four particle conversion solar wind speeds of 756 km/sec and 873 km/s are typical of the speeds of the fast solar wind. And the average of the two, three and four particle conversion solar wind speeds of 749 km/s is right on the fast solar wind average of 750 km/s. As you can see, this theory explains why the solar wind speeds are grouped into specific ranges, rather than spreading across a continuous spectrum of speeds. This theory predicts that the speed of the stellar winds of other stars, should they ever come to be measurable, will be able to be calculated from the above formulas, as we have done for our sun. These figures, above, would suggest that an average of about one part of matter is lost to the sun due to the fast solar wind for each three parts of matter converted to solar energy by the fusion process, as the average fast solar wind speed of 750 km/s corresponds with one particle of matter carrying away kinetic energy as solar wind for each three particles being converted to energy. This is in line with the figures astronomers give us for the rate of conversion of solar matter to energy of 4.26 x 109 kg/s and the loss of matter from the sun due to solar wind of 1.3 x 109 kg/s to 1.9 x 109 kg/s. This is a ratio of between 1 to 2.2 and 1 to 3.3, right in line with the approximate 1 to 3 ratio this theory predicts. One of the problems we have had up to now with our theories about solar wind is that it is not understood how the fast solar wind can accelerate up to the speeds it does. As we can see from the above calculations, though, the carrying away of excess energy from the gravitational red shift of the sun (even though the red shift itself is too small to be easily observed), could certainly account for the levels of kinetic energy of the fast solar wind. Stars with much higher gravitational fields than our sun (which are much more massive and/or denser), could also, in the same way, produce Cosmic Rays, which, like the solar wind, are mostly protons and electrons, but are much faster than the solar wind, nudging the speed of light. Is there enough energy lost from the sun’s gravitational red shift to produce the solar wind? The rate of conversion of solar matter to energy is about: 4.26 x 109 kg/s. This energy is produced in the core of the sun, but gradually percolates to the surface, where it is radiated at the photosphere. The question is whether the energy lost in the red shift of this radiation is sufficient to account for the mass and kinetic energy of the fast solar wind. This rate of emission of 1.45 x 109 kg/s is right in the range of the estimated loss of matter from the sun due to the solar wind, which is about 1.3 x 109 kg/s to 1.9 x 109 kg/s. This is based on the assumption that the solar wind starts at the photosphere at a speed of 750 km/s. If the fast solar wind starts off at a much higher speed and is slowed down the sun's gravity more than it is sped up by magnetic fields, then this mechanism might only cause the fast solar wind, and not also the slow. There are, of course, other mechanisms that can explain the slow solar wind. It is clear, though, from the above calculations, that all of the fast solar wind, at least, can be produced by energy lost from the sun’s gravitational red shift. This gravitational red shift explanation of the production of the fast solar wind has the particles of the fast solar wind originating at the photosphere. As a result, one would expect, from this theory, that the elemental composition of the the fast solar wind should resemble that of the photosphere. It is interesting to note that observational data indeed shows this to be the case. The fact that the slow solar wind has a different elemental composition suggests that it is not all produced by this gravitational red shift mechanism. 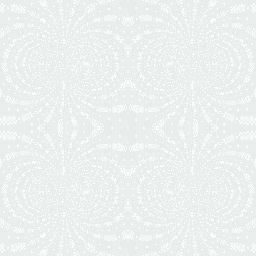 Again, to go to the article describing the cosmology and gravity theory these calculations are derived from, please click here.